Three dimensional film has become a huge trend in modern cinema and one that paves the way for a slew of major rereleases that exploit the graphical effect to boost their box office earnings - Disney launched into this trait with The Lion King 3D at the end of 2011 which, despite being nearly two decades old, managed to top $150 million worldwide - making it a roaring success even without it's $750 million earnings from previous releases. After Beauty and the Beast hit UK cinemas last year, now comes the first Pixar flick to make use of this trending attribute - Monsters, Inc.
Monsters, Inc. takes place within the fictional city of Monstropolis, where best friends Mike (Billy Crystal) and Sulley (John Goodman) work at the eponymous factory to provide global power through scaring children. 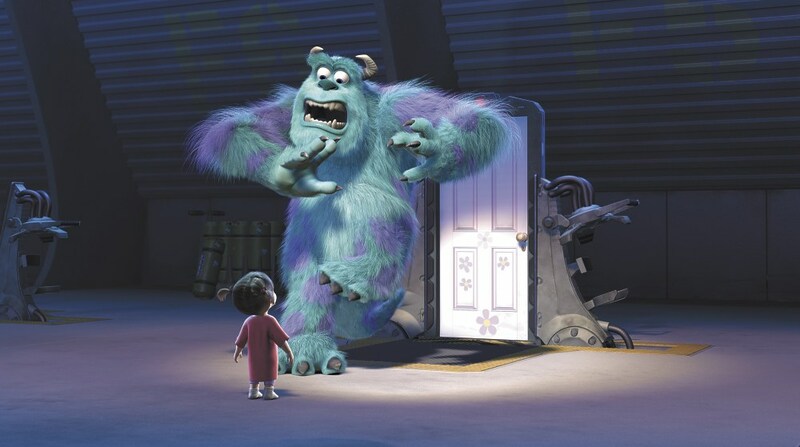 Though scaring is an easy feat, it's made clear by the CEO Henry Waternoose (James Coburn) that a single human touch is fatal - making the sudden appearance of a little girl in the factory shock a poor Sulley and force him and Mike to return her to her rightful door before their ruthless rival Randall Boggs (Steve Buscemi) or the governing Child Detection Agency can stop them. Pixar's 2001 hit proved to be an innovation for both the company and computer animation in general, with a higher focus on lead animators per character and the immensely tricky task of realistic fur rendering to bring protagonist Sulley to life through CGI. 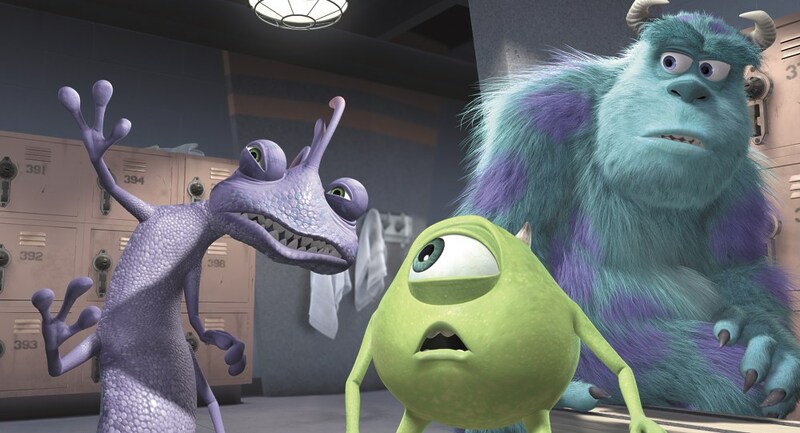 The end result, even twelve years later, is nothing short of stunning - Monsters, Inc. is a colourful and exceptionally beautiful film with fluent animation, fantastic lighting and some impressive visual effects. It's hardly different with the 3D effect, which never hurls any surprises at you and ends up being a conservative creator of depth. Half the time I felt like I was watching a brilliant film with sunglasses on. The cast is mint, with stars Billy Crystal and John Goodman injecting a lot of humour into our main characters (especially the former) and Buscemi portraying a comedic yet cunning villain in the form of Randall Boggs. The late James Coburn also delivers an excellent if short role - I could go on all day about this but the simple fact remains that Monsters, Inc. contains some of the best voice acting in a Pixar hit. Randy Newman also composes a beautiful soundtrack, packed with emotional enrichment and an equal level of memorability. Dare I say, it makes me, er herm, randy. That's disgusting, I apologize. 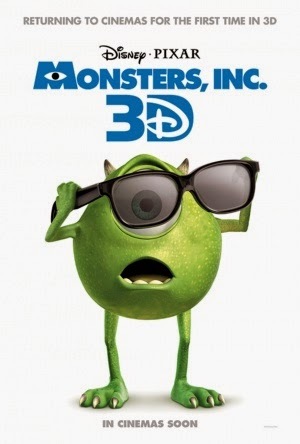 Though this 3D release is gratuitous and lacking novelty (proven by it's disappointing box office run), Monsters, Inc. remains an exceptional film from beginning to end with tons of charm, emotion and visual splendour You won't be blown away by the tacked on effect and it may not be worth the investment to some, but even getting to relive it's glory on the big screen yet again is a delightful treat in itself.